I spoke of studies in a previous entry and now here they are! April was a very productive month to get off my bum and really make good on all those promises I’ve made to myself to get better at anatomy by drawing and drawing until I can draw no more. I’ve realized if I want to get to the point of making a living at what I’m doing, I’m going to have to get better and keep up the push! 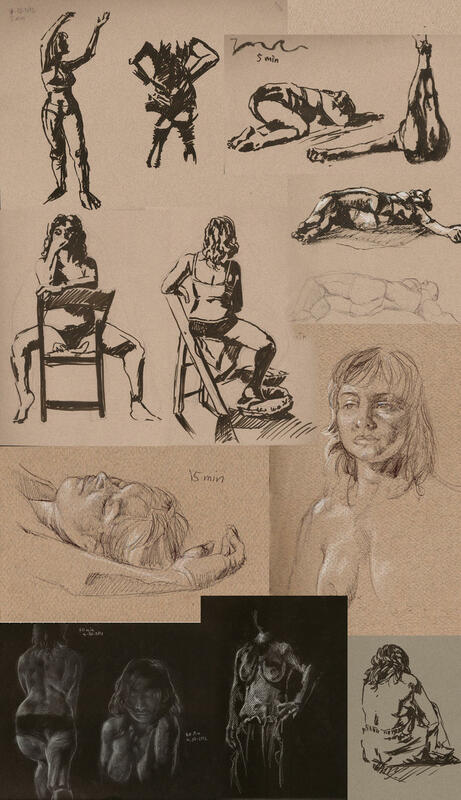 This month’s studies were accomplished through a number of life drawing sessions I attended live or using the Pixelovely tool when I didn’t have the time to leave the house. Pixelovely draws from a wonderful pool of well-lit stock photos and lets you choose the state of undress and gender of your models, as well as how long you want a session to be (with automated breaks!). I highly recommended it if you don’t have access to live models. These are just some of the studies. Had to leave some out for post length sake. 5 minutes. View high-res version. Studies ranging from 11 to 20 minutes. Mainly, I’m learning to loosen up and not be so obsessed with detail. Sketching mainly in pen without the ability to erase or with a brush pen allowed me to focus on shadows and forms instead of getting caught up in all the technical side of things. I find if we get caught up in details, we miss the energy of the model and what makes a pose interesting in the first place (something that would serve me well in depicting characters, I think!). I learned a lot about the trouble areas of the face, such as the juncture of the nose and lips and how light falls there (especially in the Bohemian Circus Night sketches). Reflected light from the floor and one’s own skin also caught my eye this month. I noticed also the most successful studies are the ones that paid attention to peak highlights, or where the light is strongest on the elements which protrude outwards (elbows, tips of noses, etc) while highlights are more soft shifts across smoother areas, like cheeks, foreheads, and the subtle muscles of the back. Tackling hands, feet, man-crotches, and facial expressions. Basically getting into those very specific areas of anatomy trouble for me. Going to try and do 100 sketches of each! It’s funny how we pick up little tidbits of knowledge from staring at the same figure in a different situation or from a different angle. Some things just ‘click’, but you’ll never get that click unless you’re always looking at the same thing and thinking about how it works constantly because the human form is just so complex. I’ve had life drawing classes in the past, but that knowledge tends to fade if you aren’t practicing all the time. Here’s hoping keeping the knowledge fresh will link up to all of the other art I’m making right now! I trust it will in that way that knowledge sticks in the back of your mind informing you in ways you aren’t even aware of. So what are you all working on? 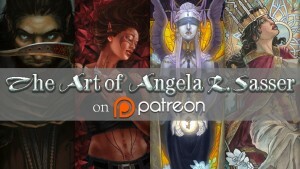 How are you challenging yourselves and keeping your art form going strong? Share in comments!